Manila, Philippines - Khen Lobaton performed Jay Z's hit song "Empire State of Mind" during the blind auditions of ABS-CBN's top-rating and Twitter-trending singing reality show aired on Sunday June 15, 2014. The 13-year old kid from Bacolod City wowed the judges Sarah Geronimo, Bamboo Manalac and Lea Salonga. Coach Sarah brings up the name of her “bebe” John Lloyd Cruz and promises the said young artist that she will get her to meet the actor if the aspiring artist chooses her as coach. In the said gimmick, Khen chose Sarah as her coach. 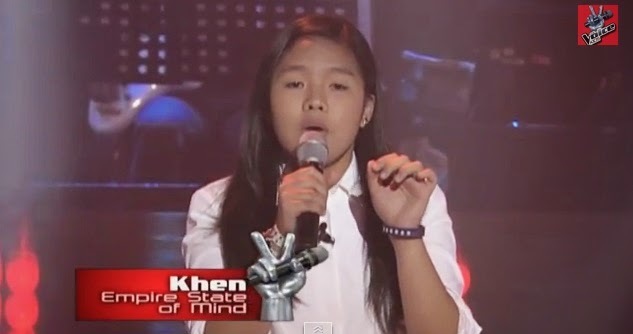 Khen Lobaton is the 11th 3-chair turner on The Voice Kids Philippines. Other artists who are included in the elite list of 3-chair turners are Jimboy Garcia, Darlene Vibares, Nathan Bautista and Echo Claridad , Arianna Ocampo, Isaac Zamjudio, Mitz Tanguilan, Giedie Laroco, Eufritz Santos and Kyle Bernido. As of the June 15 episode, 45 artists have already convinced with at least one coach to turn around, 15 hopefuls getting a slot in each team of Lea, Sarah and Bamboo. The Sunday's episode of 'The Voice Kids' dominates online conversations with '#VoiceKidsABSCBN', 'Shello", 'Khen', 'Tadhana', Empire State of Mind, 'New York Cubao' and 'Just Give Me A Reason' among the trending topics. The fourth week of the Blind Auditions signals the anticipation for the next stage of the competition as the coaches build up their respective teams composed of 18 artists. Watch out for the heart-stopping Battle Rounds that will kick off in two weeks and will determine each team’s best young artists. "The Voice Kids," which is hosted by Luis Manzano and Alex Gonzaga, airs Saturdays at 6:45 p.m. and on Sundays at 7:30 p.m.